A woman suing a Kansas restaurant for a slip-and-fall injury from a wet floor has settled for $187,500. 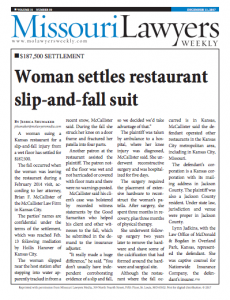 The fall occurred when the woman was leaving the restaurant during a February 2014 visit, according to her attorney, Brian F. McCallister of the McCallister Law Firm in Kansas City. The parties’ names are confidential under the terms of the settlement, which was reached Feb. 13 following mediation by Hollis Hanover of Kansas City. The woman slipped near the host station after stepping into water apparently tracked in from a recent snow, McCallister said. During the fall she struck her knee on a door frame and fractured her patella into four parts. Another patron at the restaurant assisted the plaintiff. The patron noted the floor was wet and not barricaded or covered with floor mats and there were no warnings posted. McCallister said his client’s case was bolstered by recorded witness statements by the Good Samaritan who helped his client and other witnesses to the fall, which he submitted in the demand to the insurance adjuster. The plaintiff was taken by ambulance to a hospital, where her knee injury was diagnosed, McCallister said. She underwent reconstructive surgery and was hospitalized for five days. The surgery required the placement of extensive hardware to reconstruct the woman’s patella. After surgery, she spent three months in recovery, plus three months of physical therapy. She underwent followup surgery two years later to remove the hardware and shave some of the calcification that had formed around the hardware and surgical site. Although the restaurant where the fall occurred is in Kansas, McCallister said the defendant operated other restaurants in the Kansas City metropolitan area, including in Kansas City, Missouri. The defendant’s corporation is a Kansas corporation with its mailing address in Jackson County. The plaintiff was also a Jackson County resident. Under state law, jurisdiction and venue were proper in Jackson County. Lynn Judkins, with the Law Office of McDonald & Bogdan in Overland Park, Kansas, represented the defendant. She was captive counsel for Nationwide Insurance Company, the defendant’s insurer.